As a non-dairy milk drinker, looking at the ingredients on the cartons of almond, coconut, and rice milk at the store makes me cringe (although there are some exceptions like OMilk in Brooklyn). There are just so many ingredients, many of which I can't even pronounce or spell properly. I know they're in there to preserve the milk and occasionally I find the boxes of non-dairy milks very helpful - like on road trips or for camping. However, on a typical week at home, we easily finish a full carton of non-dairy milk between coffee, tea, and baking - so we don't really need all those preservatives. Making my own non-dairy milk has always been appealing to me, so I put it on my life list and I'm happy to say that I now regularly make my own almond milk instead of buying it. It has way fewer ingredients and tastes so much better than the stuff that comes in the carton. 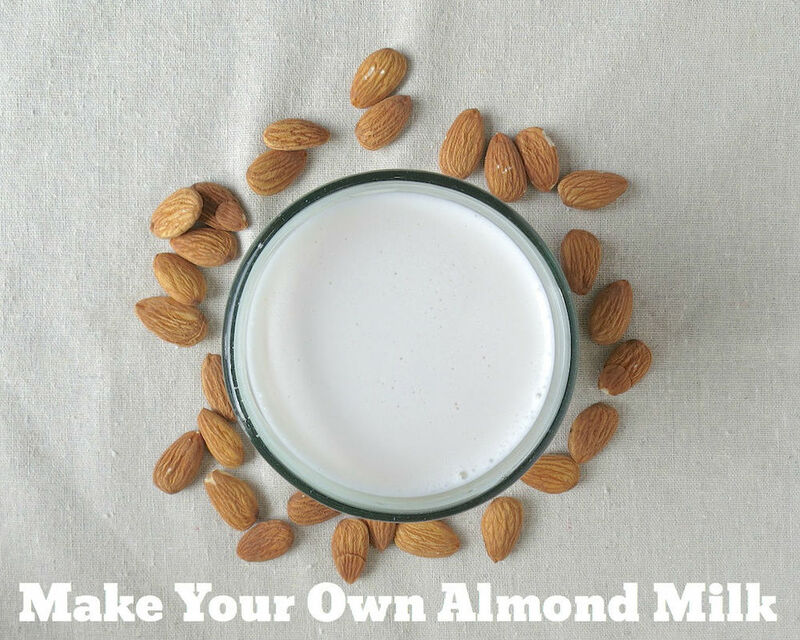 My version of almond milk is unsweetened, unflavored, rich, and creamy. It makes a good substitute for half and half and the almond flavor really shines. It's quite possible that Meyer Lemon Curd is one of my favorite things on the planet. First of all, it's something made with Meyer Lemons - so thats a win all in itself. Second, it's creamy and tart and delicious when paired with many things. My favorite way to eat it, other than just by with a spoon, is to dip ginger cookies into it. Since we're just getting to that magic time of year where you'll find Meyer Lemons in stores, I thought it was high time I shared my recipe for Meyer Lemon Curd with you. I'll make oodles of this throughout winter and then stock the back of my fridge with Weck Jars filled with it to get me through the rest of they year. Two weeks ago I mentioned that we pulled out all of our plants in our middle raised bed and harvested what we could. We ended up with a huge pile of New Zealand Spinach and basil along with two huge bowls of tomatoes and three tiny jalapenoes. 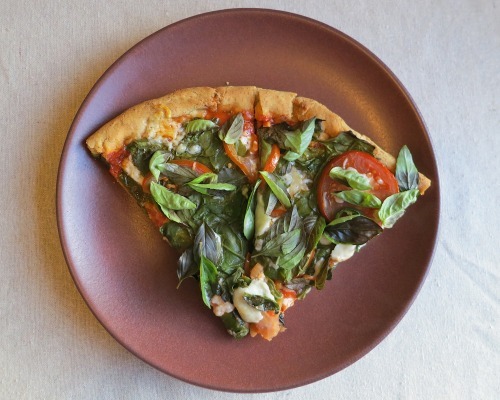 In an effort to not let all those great greens go to waste, I opted for a totally green loaded pizza. It's Gluten Free Ratio Rally time and this month I'm hosting! If you're new to the rally, check out this post from Shauna of Gluten Free Girl & the Chef to read about the very start of the rally. Based off of Michael Ruhlman's Ratio, this great group of gluten free bakers gets together each month to work on ratios for a specific baked good. Since I joined the group earlier this year, I have to say - I've learned so much more about the science behind baking. I never thought I would be making bagels or angel food cake from scratch at home. In fact, I never thought I would make cake at home ever again, as all my early trials of gluten free cake baking ended up with shriveled and rubbery looking ones. This month we're working on bundt cake; which we figured would be similar to the ratio for pound cake. Ruhlman's ratio for that is 1 part butter: 1 part sugar: 1 part egg: 1 part flour. Since I wanted to make a pumpkin bundt - I adjusted the ratio accordingly to include the puree. I assume if you wanted to used some other kind of fruit puree you could use a relatively similar ratio to the one I ended up with. My ratio turned our to be 2 parts butter: 2 parts sugar: 3 parts pumpkin puree: 3 parts egg: 4 parts flour. Full disclosure: I've never seen the movie of the same name. And yes, I know I should probably remedy this. I tried a couple of varieties of breading the tomatoes, including a battered version, but this three step dipping methoed seemd to result in the crispiest outsides and softest insides.